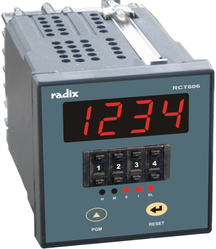 Pioneers in the industry, we offer digital timers rct 606, digital timers rct 703, digital timers rct604, rate indicator and flameproof rate indicator-rct206 from India. 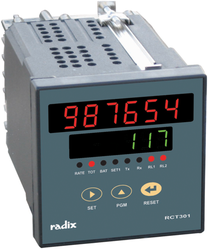 Application: Totalizer, RPH, RPM, RPS, Meters/Minute, Mains Frequency etc. 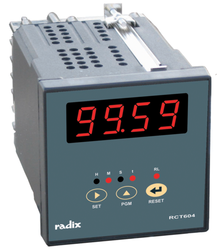 FRCT206 is a RPM indicator housed in a heavy-duty enclosure certified flameproof for gas groups I, IIA & IIB with IP65 rating - completely dust proof and a good level of protection against water. 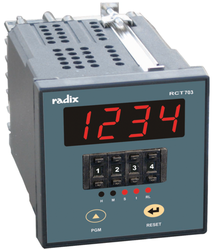 FRCT206 is a programmable RPM indicator typically used to measure motor and shaft speeds up to 5000 Hz. Looking for Digital Timers ?